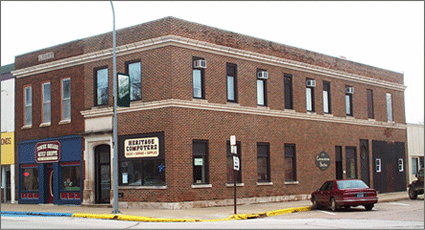 We refer to the building that houses the Cornerstone Suites as the Cornerstone Building, but it was originally The First National Bank Building. It was built by L F Danforth in 1884 to house a private banking house started by city founder Peter Smith, under the firm name of P. Smith & Sons. Ten years later, in 1894, the institution was reorganized as a national bank, adopting the name First National Bank. The building was remodeled in 1914. The original entrance to the bank was located in the northwest corner of the building. The remodel moved the entrance to the east side of the front. At the same time the outside walls were built a little higher and architectural detail over the windows was removed. Two vaults were installed inside the bank during the rebuilding and one large vault remains today. In 1959 the bank offices were transformed into an insurance office, remaining so until 2003 when a remodel opened it up to general office use. The entrance to the Cornerstone Suites is located on the west side of the building. In the building’s early days a barbershop was located in the area that is now the lobby for the Suites. More recently that area served a travel agency and later as the office of the Lake City Betterment Association. Originally, the stairway which now leads up to the suites from the lobby was accessed from the street and led up to the eight offices located over the bank. Over the years those spaces have been home to many businesses, including a tailor, dentist, and photography studio. The upstairs was eventually remodeled into apartments. A fire in 1976 rendered the space unusable until it was remodeled into the Suites in 2005.